An age-old whisky custom of ‘sweetening the stills’ has taken place at the Glenmorangie Distillery in Tain, it was announced today (Friday 27 March). Four new copper pot stills – the tallest in Scotland – recently installed as part of a major expansion at the Distillery, have been ‘christened’ with a unique botanical recipe of herbs and heather to prepare them for the restart of whisky production at the Distillery in April. The tradition is all the more poignant as the last man to sweeten the stills at the Distillery nearly 20-years ago (1990), John Murray – one of the famous “16 Men of Tain” – has passed the ‘honour’ on to his son, Dougie Murray. Dougie Murray, also one of the “16 Men of Tain”, along with the Glenmorangie Distillery Manager, Andy Macdonald, gathered the fragrant ingredients from the nearby Morangie Hill for the private ceremony which took place earlier this week. 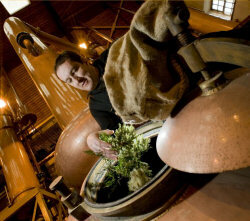 The herbs were immersed in boiling water and distilled through the stills to ‘take the edge’ off the new copper. Andy Macdonald said: “This respected whisky ritual has been carried out at the Distillery for as long as the Men can remember. While the sweetening of the stills is regarded by some as a good luck charm, its heritage is very deep-rooted and it serves to prime the copper and add to the sweetness of the product that Glenmorangie is synonymous with. Dougie Murray added: “I remember my father talking about the sweetening of the stills when it last happened in 1990. He was immensely honoured to be involved and loved the attention surrounding it. Glenmorangie’s four new, towering, swan-necked stills are made from copper and follow exactly the same design of the original stills installed when the distillery opened in 1843. The new stills will allow The Glenmorangie Company to significantly increase whisky production to meet the growing demand for premium single malt whiskies from existing and emerging markets in the USA, Far East and central Europe. 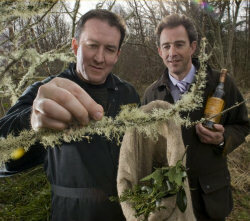 The unique ‘sweetening’ recipe of herbs includes heather from Morangie Hill and lichen which was collected at Tarlogie Springs – one of Glenmorangie’s greatest assets, a small natural spring, which supplies the Distillery with hard water filtered through lime and sandstone. Significantly, the ‘sweetening of the stills’ reflects the Company’s continued commitment to the art of whisky creation and the integrity of marrying traditional methods with new technology.